Sunday is a day for getting my body back to neutral and ready for the week ahead. Whether I'm pulling myself together after a Saturday spent hungover and nursing a pizza or I'm winding down after seeing family or running errands, I always need Sunday to act as a sort of filter between the weekend (yay) and the week (boo). A good brekkie I eat my weekday breakfasts out of tupperware at my desk and even though they're still delicious (it varies between overnight oats with peanut butter and banana, homemade buckwheat granola with yoghurt and strawberries or bircher muesli) I can't help feeling that it's not a proper, enjoyable breakfast. The whole "get yourself fuelled for the day" vibe is slightly lost because my day is already in full swing by the time I get my breakfast, so I like to have a really substantial breakfast on a Sunday and make it a proper part of the day. On a good day that means porridge made with coconut oil, almond milk, mashed banana and cinnamon or crushed avocado with feta and chilli on toast. On a bad better day this means croissants and jam, scrambled eggs and bacon or crumpets and marmite. What shall we cook? This is definitely the most frequently asked question in our flat. If me and Jack aren't cooking then we're planning what we're going to cook. Once we've eaten breakfast we'll sit in bed with a pile of recipe books and plan what we're going to make for Sunday dinner. We also like to make a meal plan for the week, I'm not sure if we do this so that we can budget our money or if it's just because I'm insanely hyper-organised and like to know on Sunday what I'm going to be eating on Thursday. Either way it works for us and it means we try a few new recipes each week. 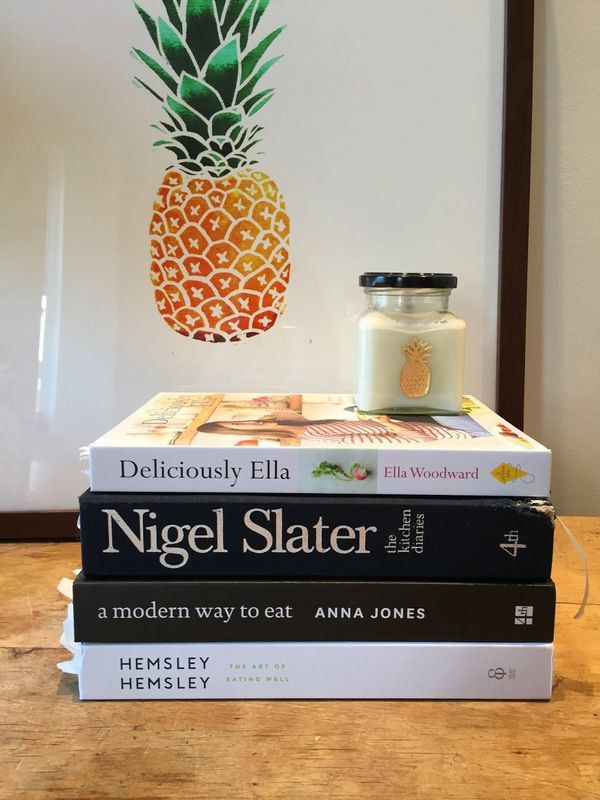 At the moment our favourite recipe books are; Deliciously Ella, I've followed her blog for about a year now and her book is equally as amazing. Nigel Slater, when I first got this book I read it from cover to cover. The style of writing makes it one of my all time favourites. I love that the recipes are simple and realistic for weeknight meals. It's good cooking in an uncomplicated way. We made the bulgur wheat with aubergines, tomatoes, fresh mint and pine nuts last week and it was SO good. A Modern Way To Eat is another beautifully put together book that's full of clean and yummy recipes. Hemsley & Hemsley, we've had a couple of misses from this book but we're sticking with it because when something's good it's really, really good. Start with the courgette and aubergine curry with toasted peanuts and fresh mint! Clean Because I have all the time in the world on Sundays I like to scrub, exfoliate and moisturise the living daylights out of myself until I'm sparkling, new and ready for Monday. I start by using the Soap And Glory Scrub Of Your Life in the shower, this is a really nice exfoliator that is gentle enough that it won't leave you feeling itchy and dry but gritty enough that you can really feel a silky, soft difference. I don't know about you but if I'm going to stand there out of the water stream for 15 minutes, scrubbing every inch of myself and getting a bit cold, I need to feel seriously soft afterwards. Once I've washed my hair I'll apply the Aussie 3 Minute Miracle Shine mask, this adds a bit of moisture and gloss to my hair without weighing it down and leaving it like an oil slick. It smells really good and one bottle seems to last forever. Whilst that's doing it's business I exfoliate my face, sing Let Me Love You by Mario (yep, that's the RnB song from 2004) and soap myself up with And Other Stories Fig Fiction Body Wash because everything in life should be fig scented, including my armpits. Once I'm out of the shower I apply the Origins Clear Improvement Clay Mask to my face whilst my pores are still open. This is my mask-of-the-moment, it gets right down in there to remove all the dirt or debris that's made my skin look dull and I always feel as if it's lifted all of the toxins out. Next I get to work moisturising with the And Other Stories Morrocan Tea Body Lotion. I love the packaging their products come in, they look so chic in my bathroom, and the moisturiser is really lightweight so it sinks in straight away. I like the tangy scent of this one that comes from the lemon and mint. After I've scrubbed the mask off with a flannel I sweep some Ren Clarifying Toner over my face and finally slather it in Pai Rosehip BioRegenerate Oil to repair my skin and pump some serious moisture in to it. Brushes Before I can completely relax I have to do the worst job in the history of make up, I have to wash my brushes. I gather them all up and wash each one separately with my Bobbi Brown Brush Cleanser. The rest of the day is spent on the sofa, watching long films and stuffing my face. Perfect. 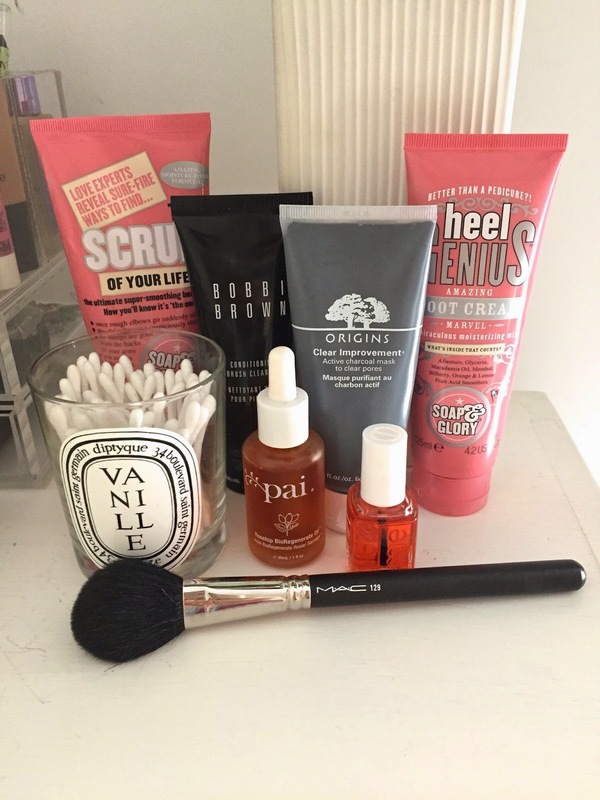 i've heard a lot of good things about that origins mask, definitely want to try it soon! Let me know if you do :) It is a little bit of an investment but my tube has lasted me about 6 months! Totally worth it. It's sounds so lovely the way you meal plan and I definitely need to start buying some cook books and building up a collection - you have some great ones there!